Комитет министров Совета Европы опубликовал последние отдельные решения, касающиеся исполнения постановлений Европейского суда по правам человека. По окончании своего ежеквартального заседания по правам человека в Страсбурге Комитет принял 26 решений относительно 17 государств-членов. Заключительные резолюции были приняты Комитетом в отношении 541 постановления и решения Страсбургского суда, касающегося 18 стран. Комитет также принял ориентировочный перечень дел, которые будут рассмотрены на его следующем заседании, посвященном исполнению постановлений, которое состоится в декабре 2018 года. Excessive length of civil proceedings and absence of a remedy in that respect. Arrest and pre-trial detention to punish the applicant for having criticised the government, in breach of Article 18 taken in conjunction with Article 5. Non-enforcement of final judgments ordering the payment of work-related benefits. Lack of prompt and sufficient measures to prevent deaths of children placed in public care; lack of prompt and effective investigation into these deaths. Unjustified refusals by the courts to register an association aiming at achieving «the recognition of the Macedonian minority in Bulgaria». Statutory limitations on use of property by landlords, including through the rent control scheme for flats subject to protected leases. Lack of effective remedy with automatic suspensive effect in deportation proceedings and absence of speedy review of lawfulness of detention. Failure by the domestic courts to give relevant and sufficient reasons to justify continuation of detention on remand; continued detention on remand with the predominant purpose of obtaining information from the applicant about third persons. Non-compliance by the authorities with domestic court decisions and lack of an effective remedy. Refusal of domestic courts to register the applicants’ associations. Ill-treatment by coastguards and other state agents and lack of effective investigations. Excessive length of judicial proceedings and lack of an effective remedy in this respect. Permanent and irreversible ban on standing for parliamentary elections due to the applicant’s removal from presidential office following impeachment proceedings. Ill-treatment and torture in police custody; ineffective investigations; lack of an effective remedy. Conviction based on evidence obtained under torture. Ill-treatment by the police in connection with violent demonstrations and ineffective investigation thereof; lack of effective civil remedies to claim compensation for the ill-treatment. Excessive length of criminal proceedings and lack of an effective remedy. Excessive length of proceedings before administrative bodies and courts; lack of an effective remedy. Excessive length of civil proceedings and lack of an effective remedy. Excessive length of judicial proceedings. Deficiencies in the legal protection and medical and social care afforded to vulnerable persons. Unlawful psychiatric confinement as a security measure and deficiencies in the judicial review proceedings regarding the applicant’s continued confinement. Overcrowding and poor conditions of detention in prisons and police detention facilities; lack of an effective remedy in that regard; inadequacy of medical care and several other dysfunctions regarding the protection of prisoners’ rights. 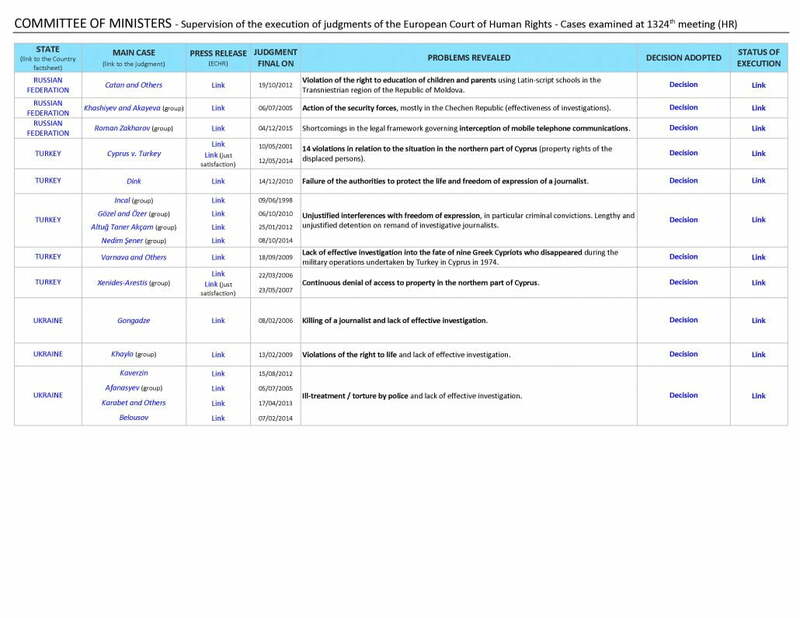 Repeated bans on the holding of LGBTI persons’ marches and pickets; lack of effective remedies; discrimination on grounds of sexual orientation in the exercise of the right to freedom of peaceful assembly. Fines imposed on the applicants for displaying banners considered to promote homosexuality among minors against the laws prohibiting such “propaganda”. Refusal to grant residence permit based on national security considerations and administrative removal in breach of the right to family life. Failure to provide information as to the fate of new-born babies alleged to have died in maternity wards. 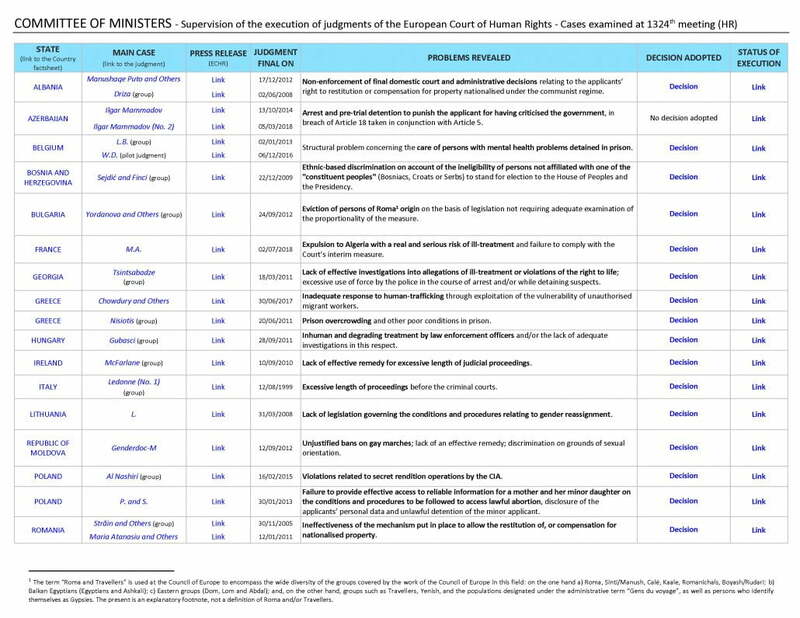 14 violations in relation to the situation in the northern part of Cyprus (property rights of the enclaved). Failure to provide protection from domestic violence. Lack of effective investigation into the fate of nine Greek Cypriots who disappeared during the military operations undertaken by Turkey in Cyprus in 1974. Continuous denial of access to property in the northern part of Cyprus. Lack of adequate safeguards in the border-control procedure to protect from arbitrary removal and lack of effective remedy. Poor conditions of detention and lack of adequate medical treatment. Non-enforcement of domestic court decisions against the State or state-owned enterprises. Государства-члены Совета Европы обязаны исполнять постановления Европейского суда по правам человека в соответствии со статьей 46 Конвенции о правах человека. Комитет министров осуществляет надзор за исполнением постановлений на основе информации, предоставляемой соответствующими национальными властями, НПО и другими заинтересованными сторонами.